Rotation of Moon.. The fact that we always see the same side of Moon means that it must rotate on its axis once for every orbit around the Earth. 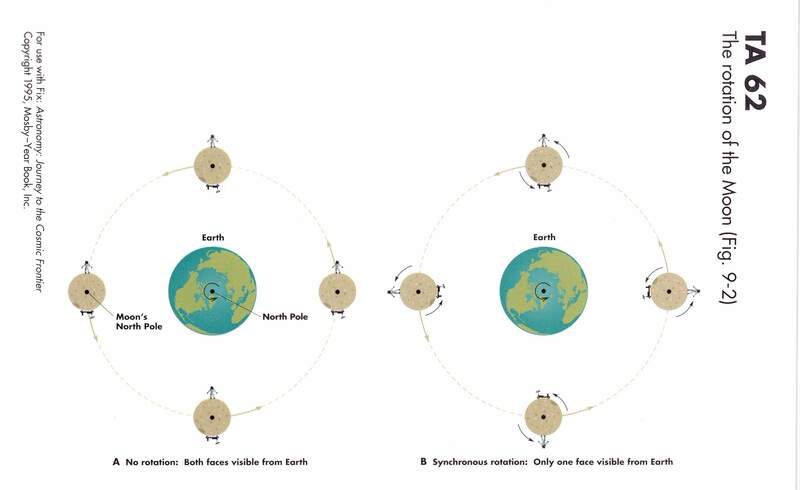 This is called synchronous rotation and is due to tidal locking. So the Moon, as seen from Earth, appears NOT to rotate, but as viewed from an outside vantage point it rotates about once a month. The true rotation period is that seen by an outside observer, and is often called the sidereal period (sidereal= relative to stars). 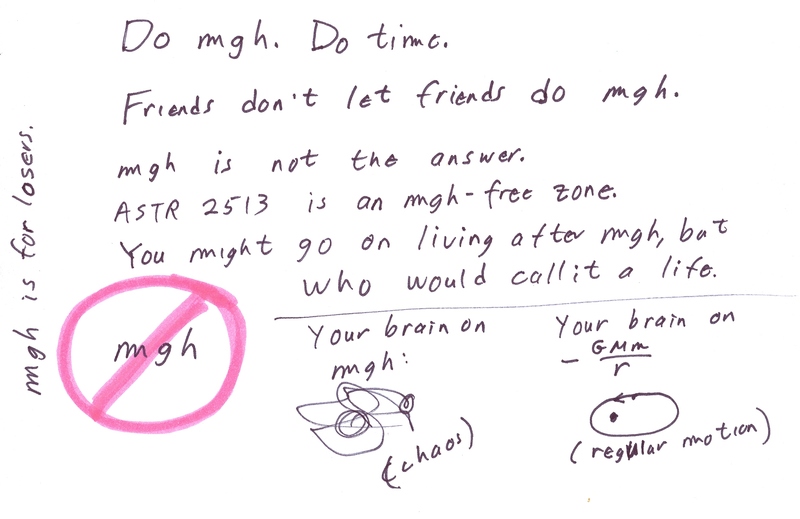 Just Say NO to mgh!. 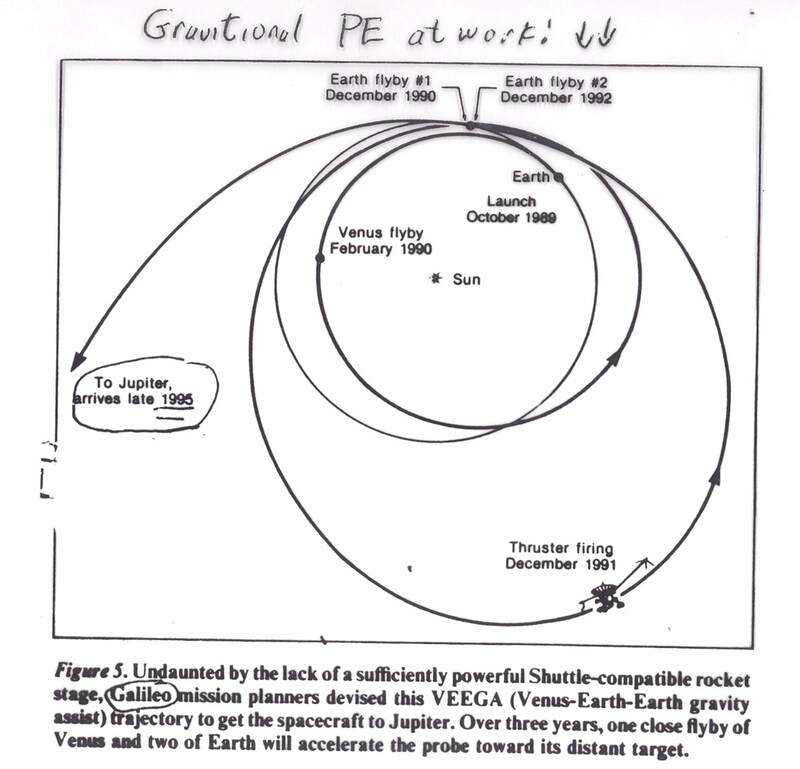 For orbital problems, the PE is not equal to mgh! mgh may be a useful equation if you are figuring the speed of a roller coaster or building a bridge, but is not useful for doing orbital problems in astronomy. These slogans are takeoffs of the anti-drug slogans that we students heard in the 1960s. Escape velocity. 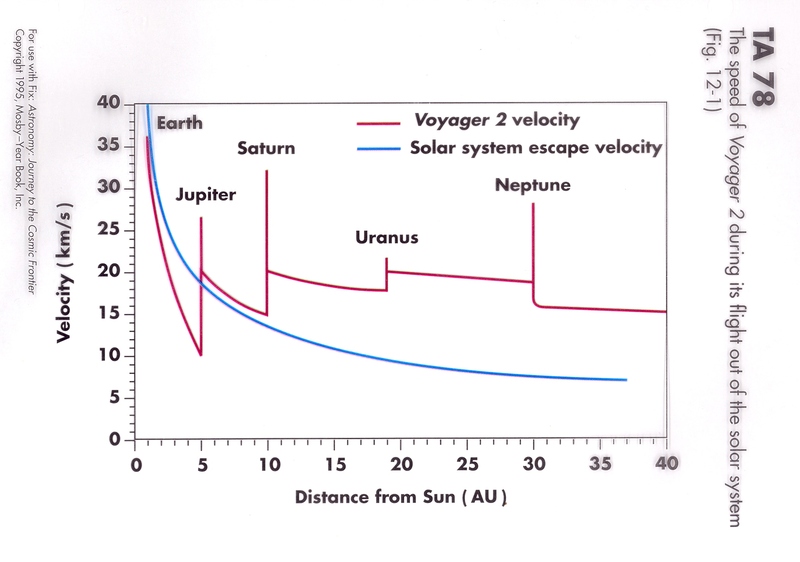 If we shoot a rocket from the surface of the Earth with the escape velocity, the rocket will travel out into space and not return. 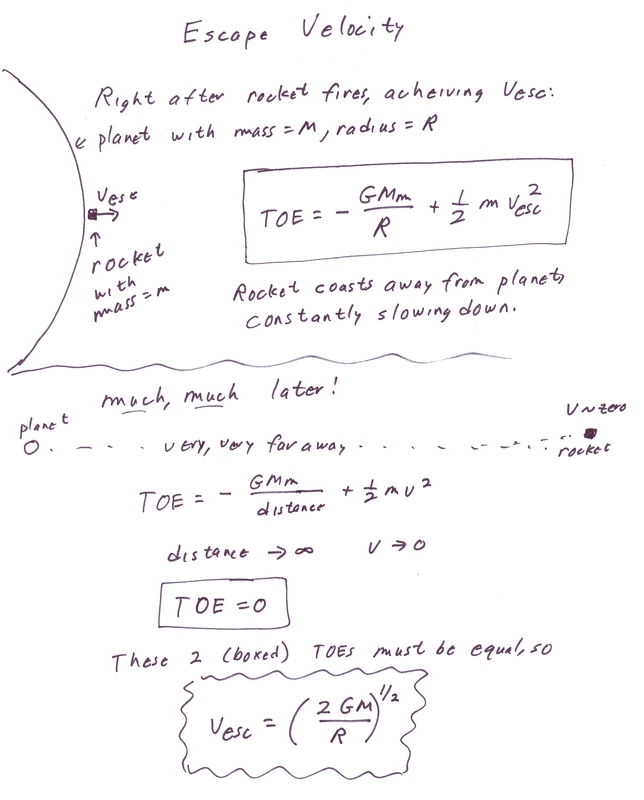 The rocket will continuously slow down, but (in an idealized case) reach zero speed at an infinite distance. 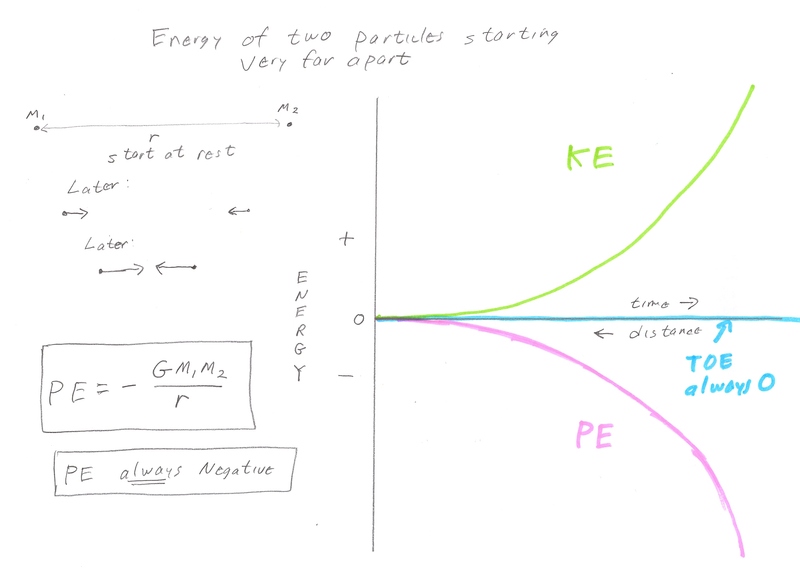 KE and PE in circular orbit. As an object orbits the Sun in a circular orbit, its speed and hence its KE (kinetic energy) are constant. 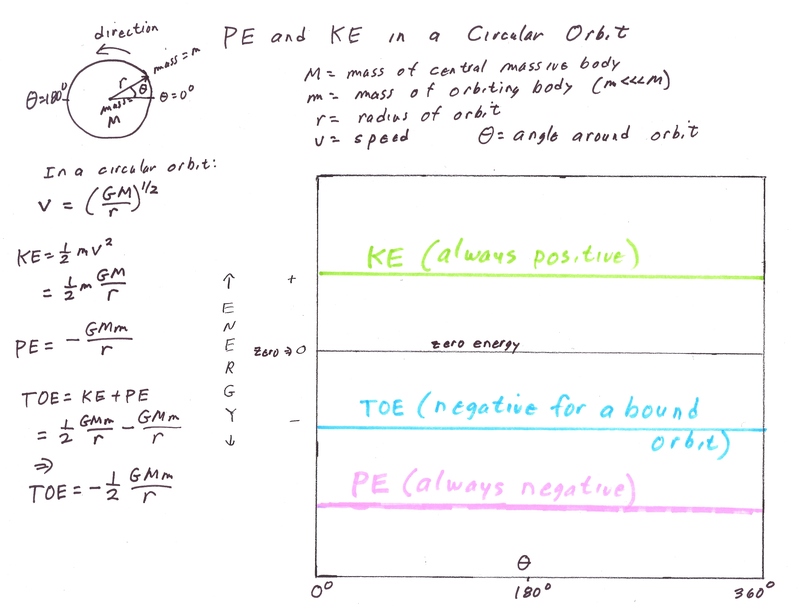 Equations are given for the KE and PE of the low mass orbiting body. (The KE equation can be easily derived from Kepler III). The total energy is a constant that is always negative, as this is a bound orbit. Some parameters of an ellipse. This shows the semimajor axis (a), the semiminor axis (b), and the definition of the eccentricity (e). We can specify the "squashedness" of the ellipse with the ratio of the semiminor to semimajor axis (b/a) or the eccentricty e. A little trig shows the relationship between b/a and e: b/a=sqrt(1 - e**2). This particular ellipse has e=0.6 and b/a=0.8. A circle has b/a = 1 and e=0. 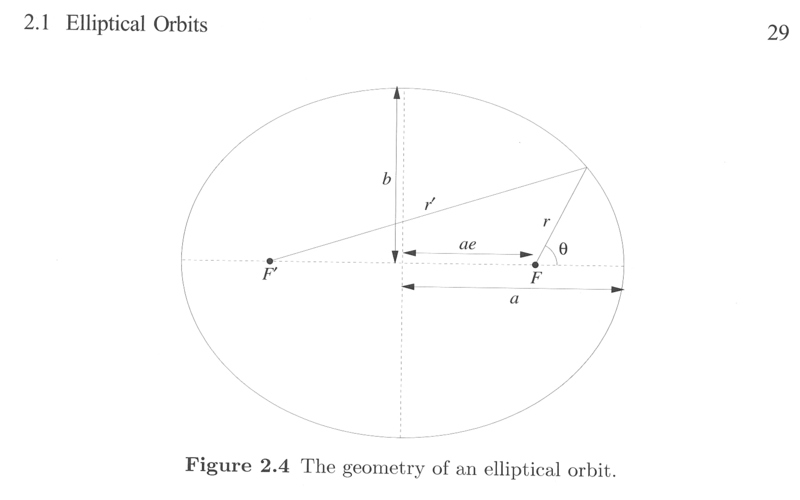 Speed in elliptical orbits. Here are 2 orbits that have the same value of semimajor axis (a). One is circular, one elliptical (with b/a = 0.5 or e = 0.866). As both orbits have the same a, they would have the same orbital period (P) around the Sun. 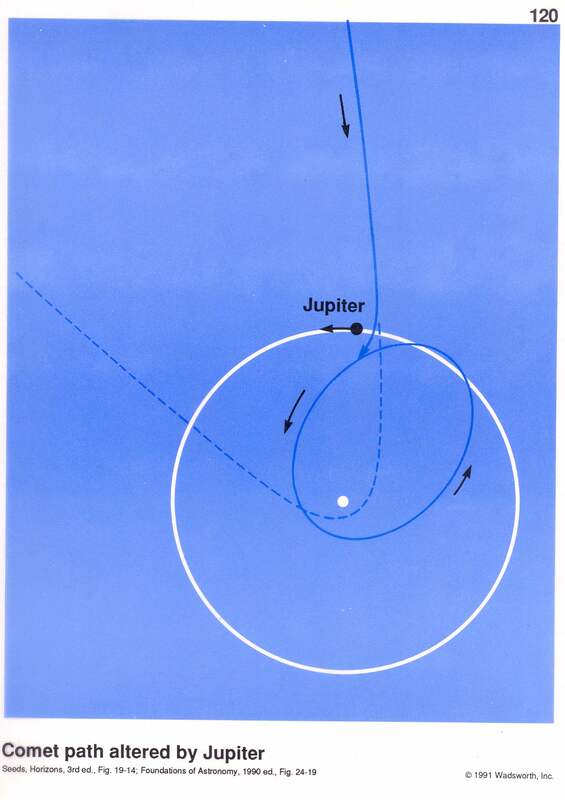 The object on the circular orbit would have a constant speed (by symmetry- there is nothing to tell one part of orbit from another). 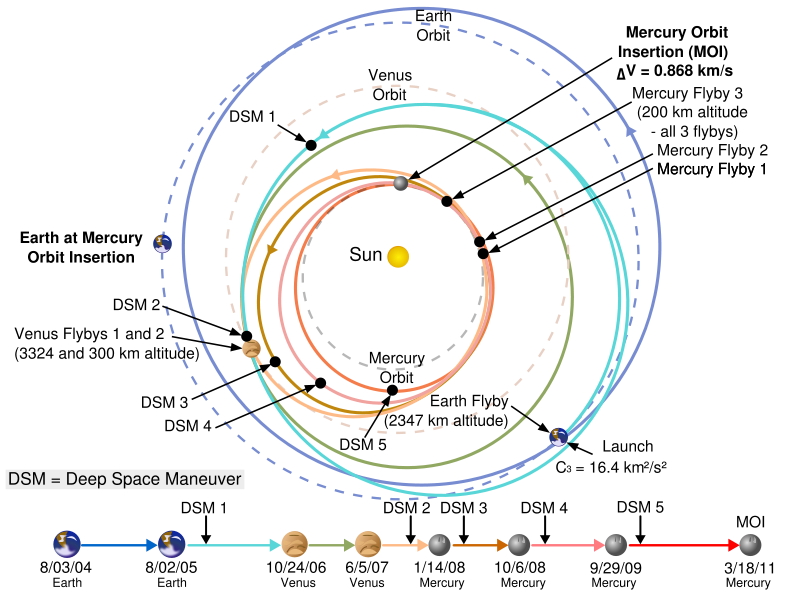 The object in the elliptical orbit would have a continuously varying speed, fastest at perihelion (point on orbit closest to Sun), slowest at aphelion (farthest from Sun). The TOTAL ORBITAL ENERGY (TE) depends ONLY on a, so equal mass objects would have the SAME *TE* in the circular and the elliptical orbits. 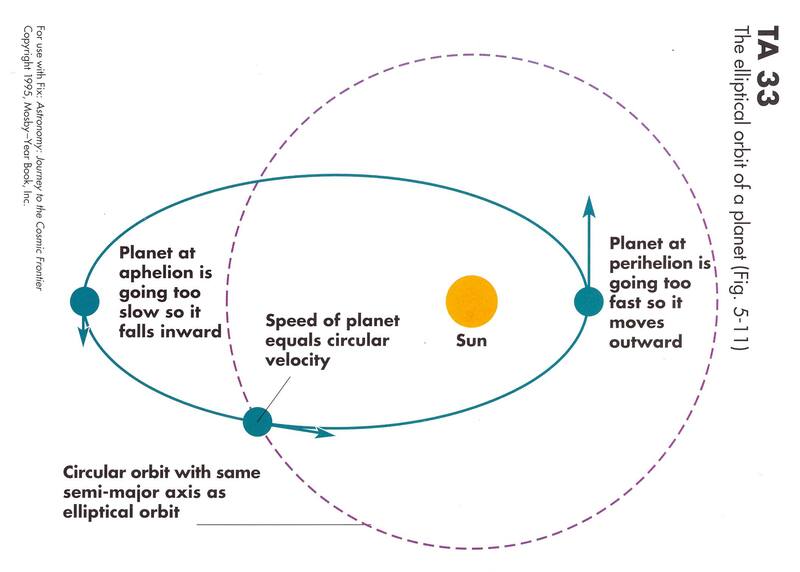 Thus, the object in the ellipitcal orbit would have speed equal to the circular orbit speed as it crossed the circular orbit distance from the Sun, as pointed out on diagram. 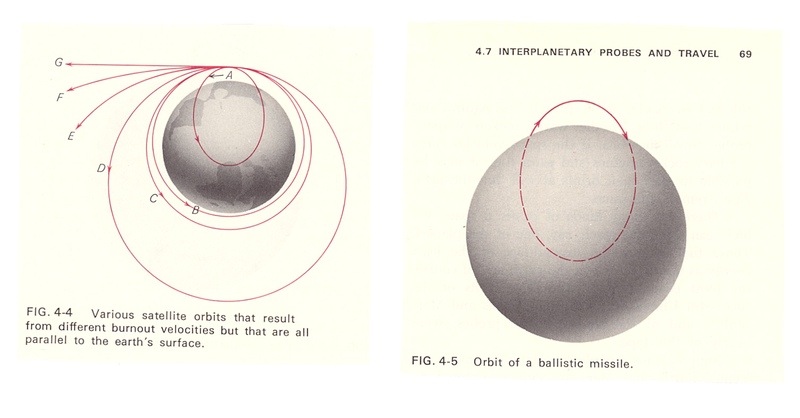 Different shaped elliptical orbits. 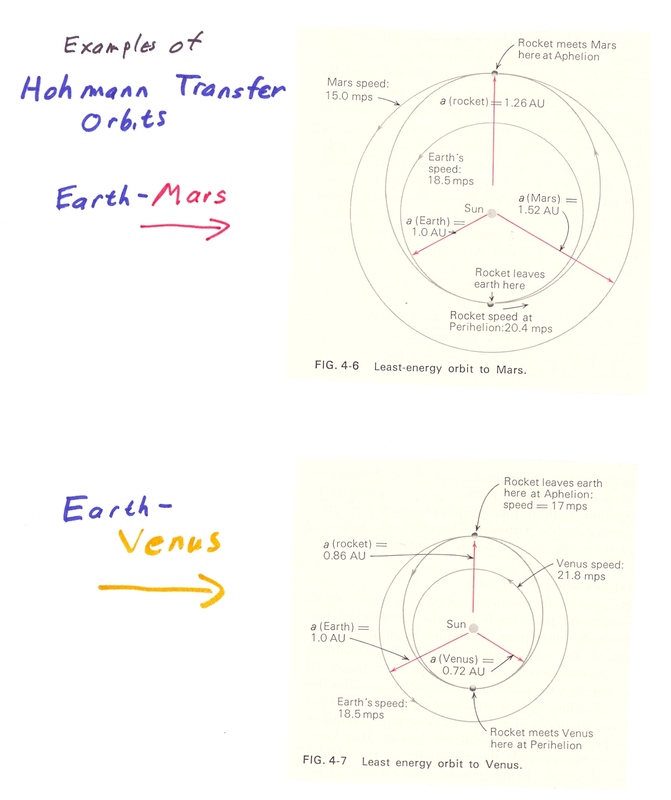 If we start out our rocket/cannonball from the same starting point, with the same KE (same speed),but with various angles to the tanget to the surface of the Earth, we get orbits with the same values of a (semimajor axis) but with different values of e (eccentrcity). All these orbits have the same TOE. Launching the rocket "straight up" would result in it moving in a straight line (ignoring rotation of Earth). This is just a degenerate ellipse orbit. Since the Hohmann orbit is just an ellipse with known aphelion and perihelion, you can easily find the semimajor axis and from that the period of the Hohmann orbit- it obviously takes 1/2 the period to get from the inital body to the other body. 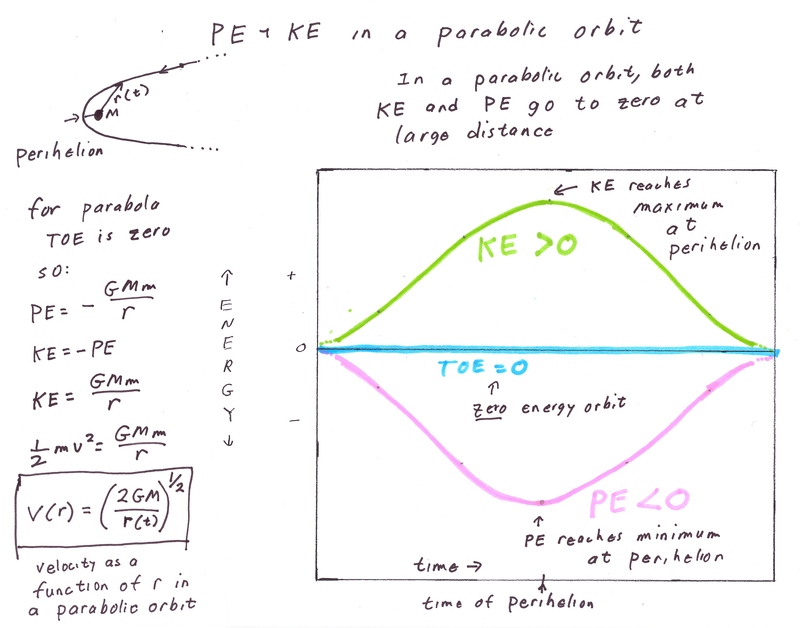 KE and PE in parabolic orbit. This is an orbit with a total orbital energy of zero. In such an orbit (in the idealized case) the object will not reach a finite distance and turn around. Thus we say this is an unbound orbit. All circular and elliptical orbits have a "turn around point" so they are bound orbits. It is useful to consider the parabola as the dividing line between bound (elliptical) and unbound (hyperbola) orbits. Bound and unbound are also related to TOE. All bound orbits have a negative TOE - all unbound orbits have a positive TOE. Parabolic orbits, with TOE = 0 , mark the dividing line between bound and unbound. 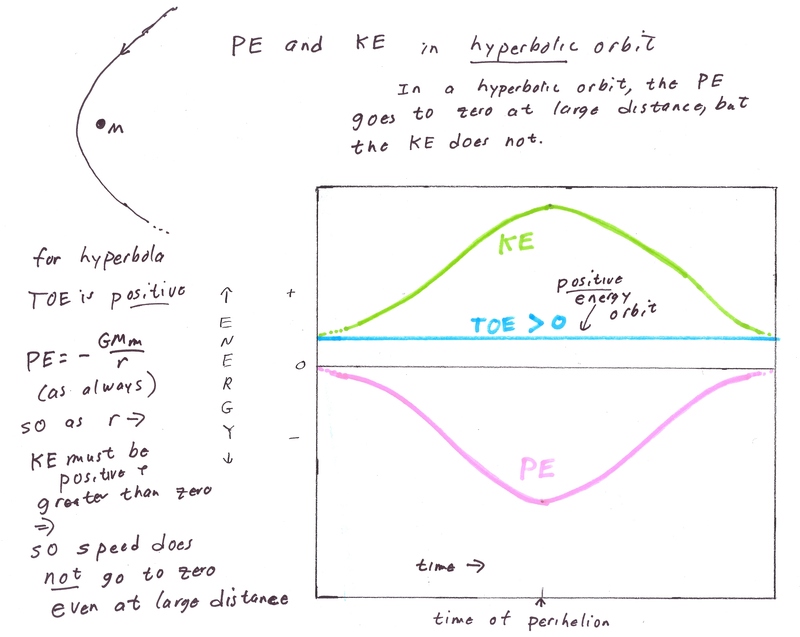 KE and PE in hyperbolic orbit. This is an unbound orbit with a positive total orbital energy. 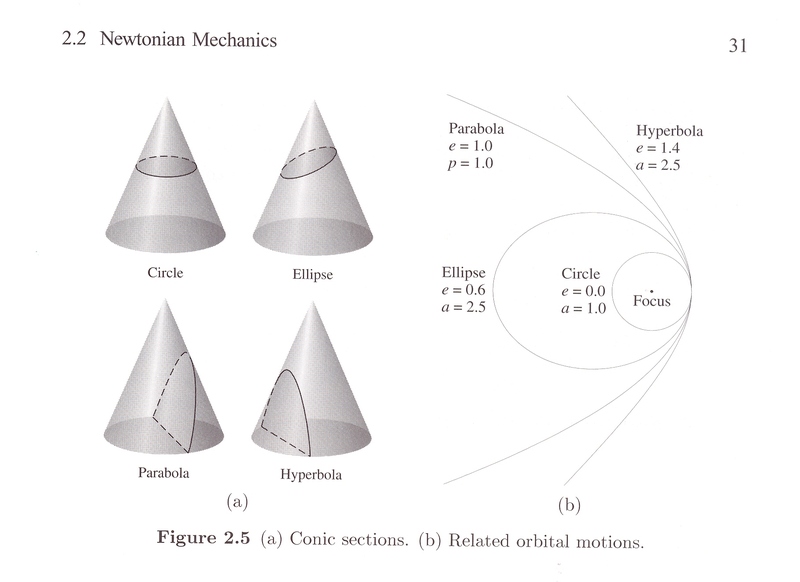 Conic section curves and orbits. 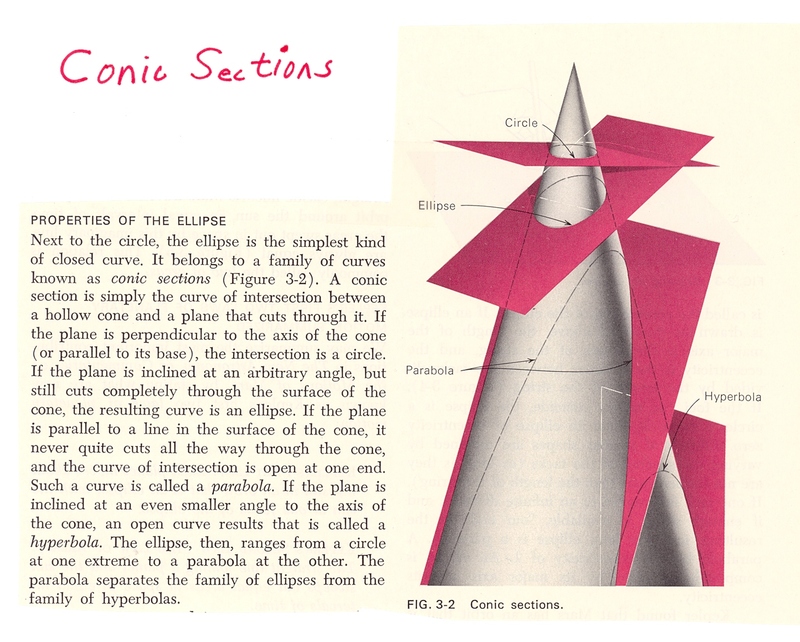 The intersection of a plane with a cone will generate curves called conic sections. 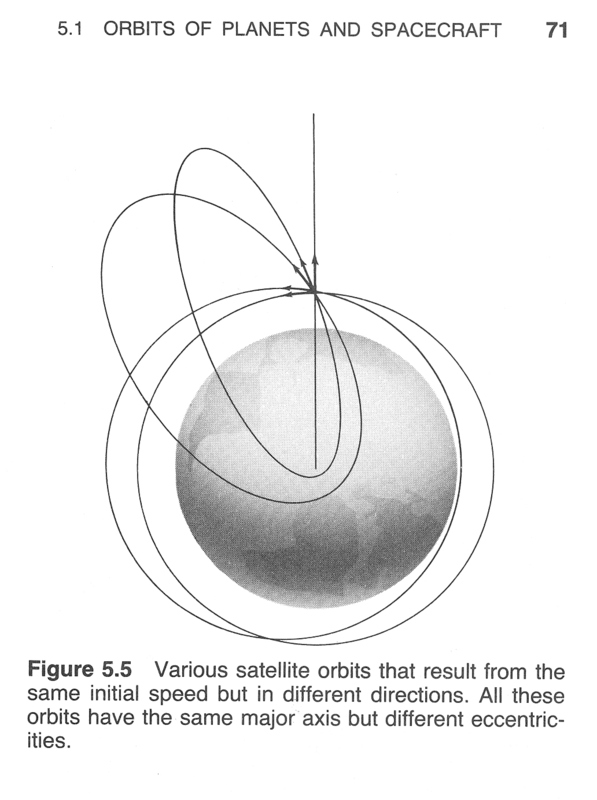 Gravitational orbits result in paths which are always a conic section curve- ellipses (circle is a special ellipse) for bound orbits, parabola for the dividing line between bound and unbound orbits, and hyperbolas for unbound orbits. 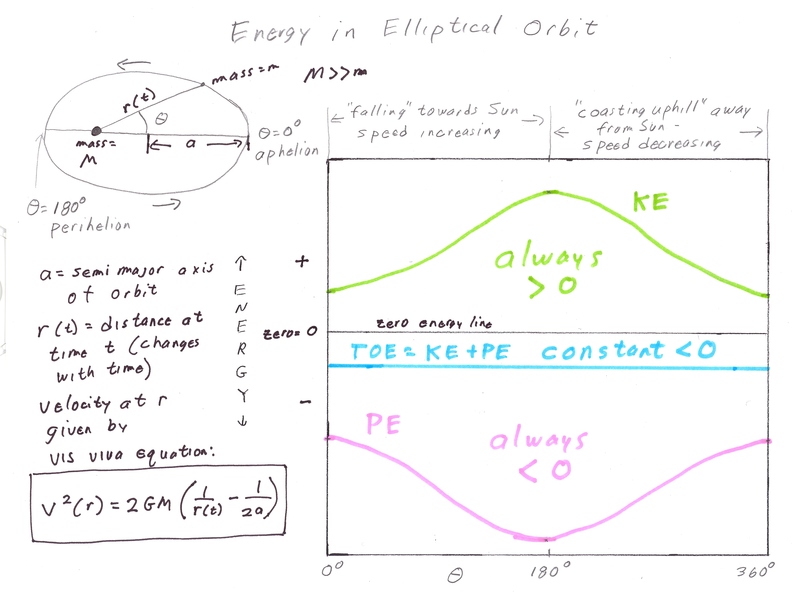 The shape of the orbit (ellipse, parabola or hyperbola) is also related to the total orbital energy (TOE). All ellipses have TOE less than zero. All parabolic orbits have TOE equal to zero. All hyperbolic orbits have TOE greater than zero. The following show just a few examples of the rich phenomena that are possible when we have more than 2 bodies involved in gravitational interactions. So how can we deal with the real Solar System (or real galaxy, or real universe) which obviously has more than 2 bodies? 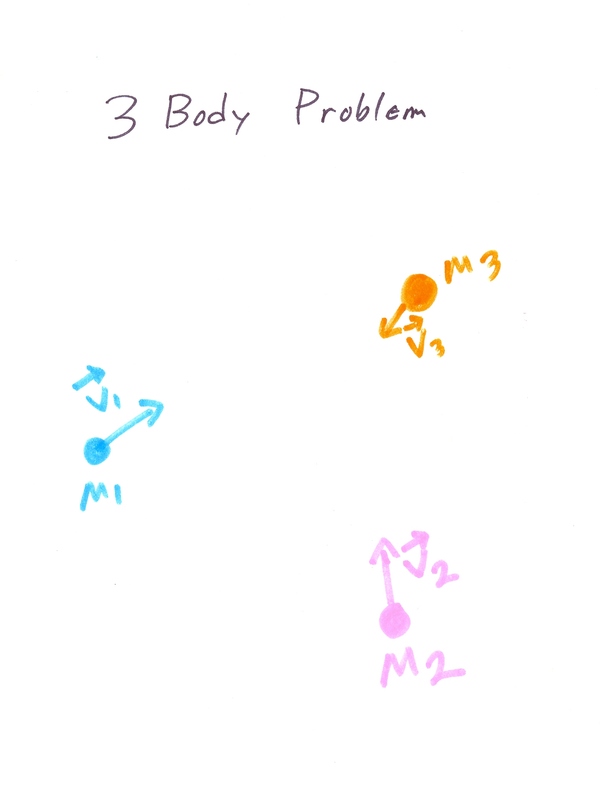 We can use a computer to make a numerical simulation of the motion of the bodies. Such simulations are usually called "n body simulations", where n is the number of bodies in the simulation. We start out with initial positions and velocities. We assume the velocities (speeds and directions) are fixed for some small time step, and we calculate the new positions at the end of the small time step, using the initial positions and velocities. Now we use the new positions to calculate the (changed) gravitational forces between the bodies, from which we can calculate new velocities, so we start over again. Essentially, we need to assume the objects move in a straight line over the time step. (The real paths will be curved). If we have a small enough time step, we can follow the motion to high accuracy. Small time steps= MANY calculations, which is why dynamicists (people who study the dynamics or motions of gravitating systems) are always wanting faster and faster computers. Of course, computational dynamicists have invented many numerical and programing "tricks" to speed up such computations, but they still will gladly use all the CPU cycles they can beg, borrow, or steal. 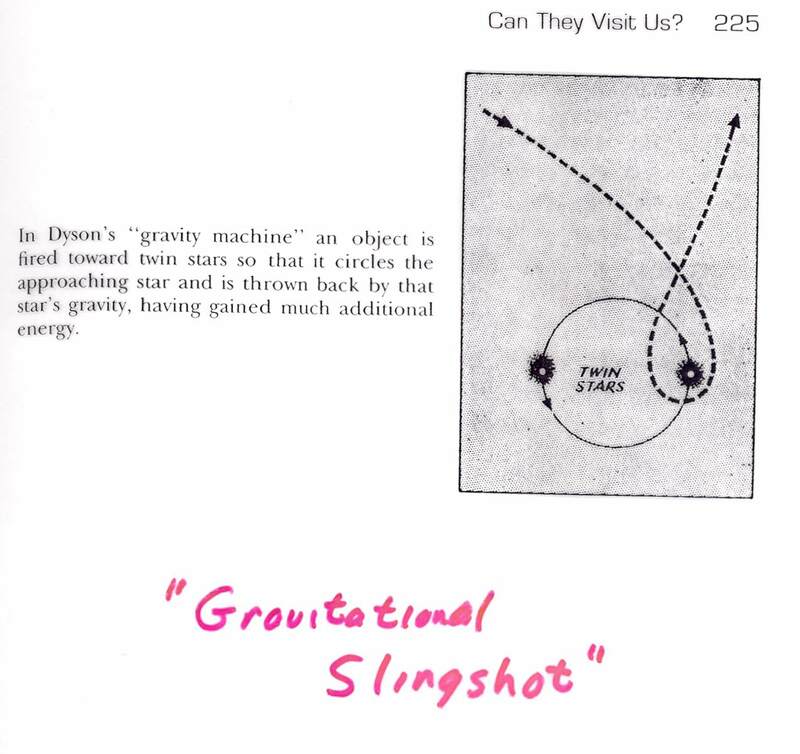 MESSENGER trajectory. Spacecraft MESSENGER, now on its way to Mercury, is taking a very long and complicated path to Mercury, using multiple gravity assists.